The Middle Ages are a time period in European history. They started around the year 476 CE when the Western Roman Empire ended, and continued until around the time Christopher Columbus discovered the New World in 1492. The 'Middle Ages' are called this because it is the time between the fall of Imperial Rome and the beginning of the Early modern Europe. This period of time is also known as the Medieval Age, the Dark Ages (due to the lost technology of the Roman empire), or the Age of Faith (because of the rise of Christianity and Islam). When used narrowly, the term "Dark Ages" refer only to very early period, from 476 to 800 B.C.E. (when Charlemagne became Holy Roman Emperor). The fall of the Roman Empire, and the invasions of barbarian tribes, devastated European towns and cities and their inhabitants. The Dark Ages are given this name because Europe was in disarray in comparison to the orderliness of classical antiquity and life was short and poor. Since few could write, little is known about it. Much of the knowledge that the Romans used (science, technology, medicine, and literature) was lost. The Dark Ages period was marked by mass migrations, wars and plagues. This lasted some 300 years until the development of feudalism partly diminished the continuous violence. Emperor Charlemagne was crowned in 800, and he promoted order, education and civilization. Europe began slowly regain what was lost during those centuries. During the Middle Ages, Europe changed as the remains of the great Western Roman Empire slowly became independent, unified nation states including England, France (The Franks), Germany (Germania), Hungary, Spain and Portugal. Meanwhile, the remains of Eastern Rome had become the Byzantine Empire, which was started by Roman emperor Constantine in 330, and likewise had a capital city named Constantinople. The Byzantine empire controlled Asia Minor and Northern Africa, and sometimes Southern Spain and southern Italy, but its lands were slowly eaten away by enemies like the Turks and the Franks. As a walled city on a peninsula the city of Constantinople was difficult to attack. The Ottoman Turks eventually seized Constantinople in 1453. They called the city by its present-day name, Istanbul. The Fall of Constantinople is sometimes called the end of the Middle Age. Islam was founded in the early 7th century by the Islamic prophet, Muhammad. Muslims believe that the Qur'an is God's ultimate revelation to mankind. Islam spread quickly through warfare and along the major trade routes of the old world, finding appeal with traders and travellers. The Islamic religion soon split; between the Sunni Muslims and the Shi'a. The Sunni religion is the majority (roughly 85% of Muslims belong to this sect), Most Shi'a live in modern-day Iran and Iraq. The Sunni-Shi'a split has been compared to the Catholic-Eastern Orthodox split of the Christian church much later in 1054. Muslims quickly conquered the Christian countries of Iraq, Syria, Egypt, North Africa and Spain. The Christians were able to keep France and other European countries. Later Muslims took other countries such as Persia and India where they built the Mughal Empire. The Muslim Ottoman Empire eventually conquered parts of eastern Europe. The Muslims took hold of vast areas of land making them a superpower of the Middle Ages. During the Early Middle Ages, Muslims achieved what is remembered as a golden age of knowledge. During these times of strife in Europe, Muslim caliphs gathered the ancient texts of the great empires (Rome, Greece, Egypt) and attempted to re-integrate that knowledge. During this time a Persian Muslim helped develop progress in algebra. The golden age of Islam ended with the Ottoman invasions in the 11th century. During the Middle Ages trade between countries became much more common. It was mostly through the Middle Eastern / Asian trade route known as the Silk Road. Arabs served as the middle men in international trade. Trade in this time was based on how valuable the item was. The items that had higher value, and low weight, travelled the farthest (gold, silk, etc...), and items that were heavier and worth less would travel mostly short distances. Food, for example, would mostly travel only within a few villages. During the high Middle Ages, wealth began to return and consumers began to demand luxuries again. Silk, porcelain, spices, incense, gold and gems, all travelled thousands of miles across deserts, mountains and plains. Glass was in turn imported from Europe to East. 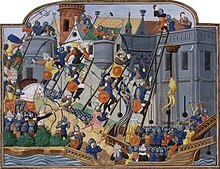 Trade was greatly interrupted several times during the Crusades (1095-1291) due to the aggression between Muslims and Europeans, and because of Mongolian Invasions, and later because of the Black Plague. It is thought that the Mongols brought the Plague with them from Asia, and devastated the world population from 1347-1351. Almost a third of the world's population was killed by the plague at this time, although the Americas were not touched by the disease at all. Buddhism is a non-theistic religion (in other words, Buddhists don't believe in a god) that is based on philosophy. It began in India but is almost entirely gone from that area now. Muslim invaders of the Mughal dynasty drove out this system of beliefs, more or less forcing Buddhism to flee East (where it eventually took strong roots in China). During the Middle Ages the Mongols created the world's largest empire, controlling much of Asia, the Middle East, and far eastern Europe. Mongolia was so large and powerful that its strength imposed what was later called the Pax Mongolica, similar to the Roman Pax Romana (pax is Latin for peace). With no war inside the Mongol Empire; international trade and diplomacy along the Silk Road greatly expanded. Mongol leader Genghis Khan built an empire that was so large, it collapsed under its own size (much like Alexander the Great's did) around the time of the Khan's death in 1227. The former Mongol empire was split four ways, leaving the Chinese to become the dominant power in the Far East once again. Later, the Chinese took control of northern China again under the Yuan Dynasty. Painting of Donia and Jelckama fighting for the freedom of his people. The painting is called: "Dapperheid van Grote Pier", which means: "Bravery of Greate Pyr". Around 1405, A Chinese admiral named Zheng He went to explore the world. His fleet of 300 'treasure ships' explored great areas of the Eastern world, and were many times larger than anything the Europeans had built. (A Zheng He Treasure ship was wider than Columbus' ship 'Santa Maria' was long). Unfortunately for Zheng, his voyages were ended before he had a chance to discover the Americas. The Late Middle Ages were the last two centuries of the Middle Ages, from around 1291 (when the crusades ended) to 1492 (Columbus voyage to the new world). During this period the gun changed war and aristocracy and feudalism became less important. States founded standing armies. Before, armies were only formed when there was a war. States only made their laws, money and identity the same in the entire country. Technology, economy and science developed. Cities were founded and existing cities grew larger and richer. France and England fought the Hundred Years' War. The Grand Duchy of Moscow regained its independence from the Mongols just like the Chinese, and under the name "Russia" became the most important state in Eastern Europe. In the 15th century, the Ottoman Turks conquered the Byzantine Empire. That event cut off the Silk Road, and the Europeans had to find new trade routes. In turn, the Muslims were driven off Spain. This event triggered the Age of Discovery during the Renaissance. 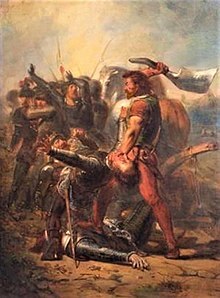 In the late Middle Ages the Frisians rebelled against the Habsburgians from 1515 until 1523. They were lead into battle by the legendary warriors and warlords Donia and Jelckama. They were eventually defeated and decapitated (beheaded) in Leeuwarden.